Who here has a laser on either a handgun or rifle? Do you use it much at the range or is it for a "what if" scenario? Re: Laser on your gun? I've decided I'm going to save a little and buy that Center Mass laser I've always though was super cool. I'd also like to try a 92FS with Crimson Trace grips on it. I've played with them, but never shot one with them on it. No lasers. If I ever get NV sorted, I may consider an IR laser for the Varmint destroyer. I have a light/laser on my SIG GSR 1911. I use that one for Home defense so I don't have to search for a flash light and so I will have a free hand if I need it. When I carry a 1911 it is my SIG 1911 sans rail with a flashlight on my hip. 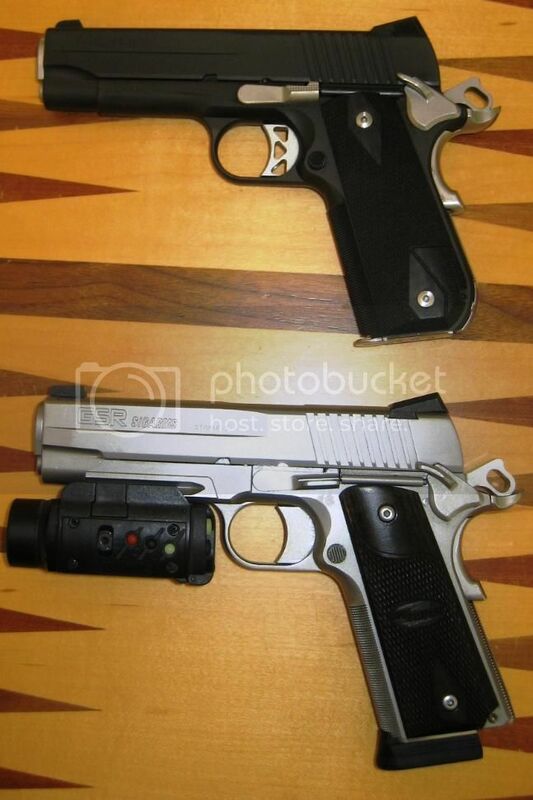 I figure if consistency is key, well these two guns are both 4.25" 45 ACP SIG 1911s with 8+1 rounds each. They are practically identical except for the bobtail and the rail. I have laserlyte center mass on my px4 storm sub and love it..
Oooooooooooo, I've been wanting that center mass for my shotgun. I was huge into the laser thing in the late 1990s. Of course, they were not nearly as good. Now, they just don't do much for me. I have a laser / light combo on my P229R. i use it 99% of the time for the balance the 3 oz provides on the rail, and 1 % for the light. The laser is an infrequent training aid when I'm dry firing. I've always wanted a laser on a pistol for use as a dry fire training aid and for a "just in case" feature if I ever end up in a defensive shooting where I have the chance to shoot from behind cover without having to properly line up sights. I just got a S&W Bodyguard 380 with integrated laser so have that covered now. Now that there are laser/holster combos that will actually engage the laser as you draw I can imagine that becoming a great option for a faster initial shot. Something that's on my list but somehow gets bump for other things. I have a Vidrian green on my M&P 9mm and a Crimson Trace on my Shield. As far as I am concerned laser sights are the only way to go. Just point and shoot. There is just no faster way for me to acquire a target. Neither of mine are the least bit cumbersome. The Crimson Trace unit is very compact and exceptionally well designed. If I am carrying I will guarantee you that it will have a laser sight until something better comes along. My brain doesn't like 'em. Had Crimson trace grips on my 1911 and tried a TLR-VLR on my 92A1 with the similar results. Running point and shoot drills at the range the laser seems to slow me down and create a hesitation. I actually liked the crimson trace grips. They were easy to use and didn't add any bulk or discomfort. I just put this Crimson Trace Rail Master CMR-201 on my Smith and Wesson SW-99. It activates with ambidextrous tap switches. Very nice. Now I'm ready for the bump in the night. That is pretty cool! I had a SW99 once too. Back in 2005, I think. Good gun. Question... how often should I replace the batteries, just to be totally on the safe side? I took in a Taurus PT 140 Millennium Pro with Crimson Trace in trade at the Canby gunshow last weekend. The battery died today. I called Crimson Trace and they are sending a new battery for free! I was also surprised that the lifetime warranty on taurus is lifetime---meaning even though I got it used, the warranty is still good. I am not a fan of taurus but that is a very good feature of their warranty.